Ogden Energy Group Inc. designs, builds, and operates 27 waste-to-energy facilities across the United States. Ogden’s Huntington, N.Y. plant processes 900 tons of municipal solid waste daily, recovering approximately 25 MW of electricity. Ogden was concerned that a water-cooled cooling tower could develop a large water plume, so the firm selected an air-cooled condenser for Huntington. The system cuts the plume and is more acceptable to the surrounding community. The facility is equipped with steam jet air ejectors from Croll Reynolds. The twin-engine, two-stage ejector removes air and noncondensables from the exhaust of the turbine and air-cooled condenser. Housed on the same skid is a single-stage “hogging” air ejector to evacuate large quantities of noncondensables from the system at start-up before the higher vacuum, lower capacity ejector takes over. The ejectors use steam at approximately 90 psig from the plant steam supply. The ejector at the Huntington facility consists of two 6 in. x 5 in. Y stages and a 3 in. x 3 in. Z stage, constructed of carbon steel with 303 stainless steel steam nozzles. A 12 in. diameter intercondenser and an 8 in. diameter aftercondenser have carbon steel shells and 304 stainless steel tubes, tubesheets and channels. The single-stage hogging ejector is made of carbon steel with stainless steel nozzle and carbon steel silencer. lt is designed to evacuate 14,250 cubic feet of air from atmosphere to l0 in. Hg abs in 30 minutes. Ogden reports that the ejectors have shown a strong advantage from a maintenance perspective as well. 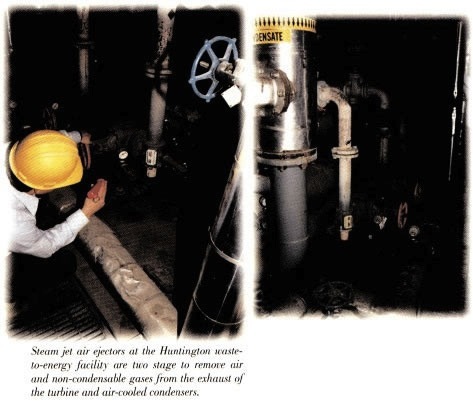 The Huntington facility operates continuously 24 hours a day, every day. The facility has three boilers, so even in maintenance periods, one boiler is down while the other two continue service. In more than six years of operation, little or no maintenance has been needed on the Huntington ejectors.